We headed to Valdez, but it would take us a couple of days to get there. 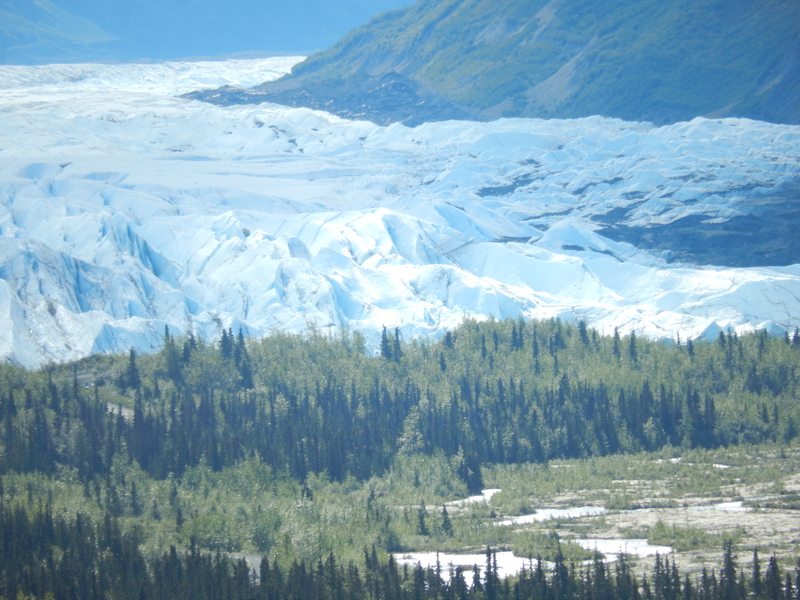 On our way from Palmer we stopped at an overlook for the Matanuska Glacier. You would think, “ya seen one glacier, ya seen ’em all,” but I continue to be amazed at these things. This one was huge, twenty-four miles long and four miles wade, descending twelve thousand feet from its summit to the bottom. As it retreated a section of the glacier separated from the main part and became dormant. It is slowly melting and has been overgrown with a layer of topsoil and vegetation. We spent the night in a small campground near Glennallen, AK. After dinner we gathered around a campfire for S’mores and singing. One of our new friends, Norman and I entertained the group with a mix of folk songs and country western. Aside from the man-eating mosquitoes, it was a fun night. Today we drove 135 miles to Valdez. Enroute we stopped at the Wrangell-St. Elias National Park and Preserve. This park covers 13.2 million acres. Most of the park is designated as wilderness and most visitors will see little of the park up close and personal. This doesn’t mean you can’t go there. There are campgrounds and lodges and opportunities for camping, hiking, paddling, fishing, and hunting. However, because of the wilderness designation, no motorized vehicles are allowed in most of the park. Native Alaskans are allowed to do subsistence hunting throughout the park. We traveled over the Thompson Pass, along the route that the goldrush miners traveled to get to the Yukon gold territory. In 1953 Thompson Pass had a snow accumulation of 974 inches! There was a long (7.5 miles) of downgrade from here, thank goodness for the exhaust brake! On the way down we stopped to see where a river had eroded a cave in a glacier and the “Old Railroad Tunnel.” The tunnel is all that remains of a failed attempt by nine companies to make a short route from the coast to the gold fields. 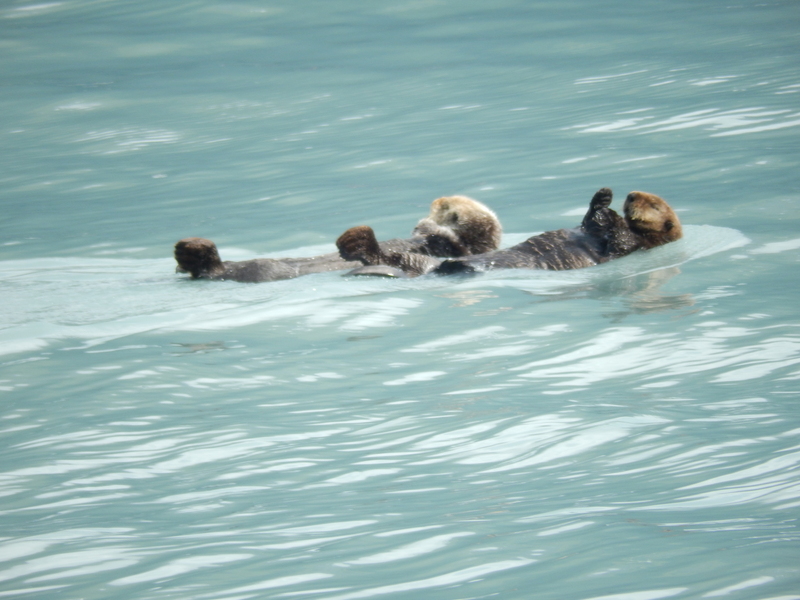 We gathered to take a boat tour in Port Valdez and Prince William Sound. Captain Fred of the LuLu Belle kept up a running commentary describing the history of Valdez, Prince William Sound, the 1964 earthquake and the Exxon Valdez oil spill. We didn’t see as much wildlife as we hoped, but Captain Fred did his best. 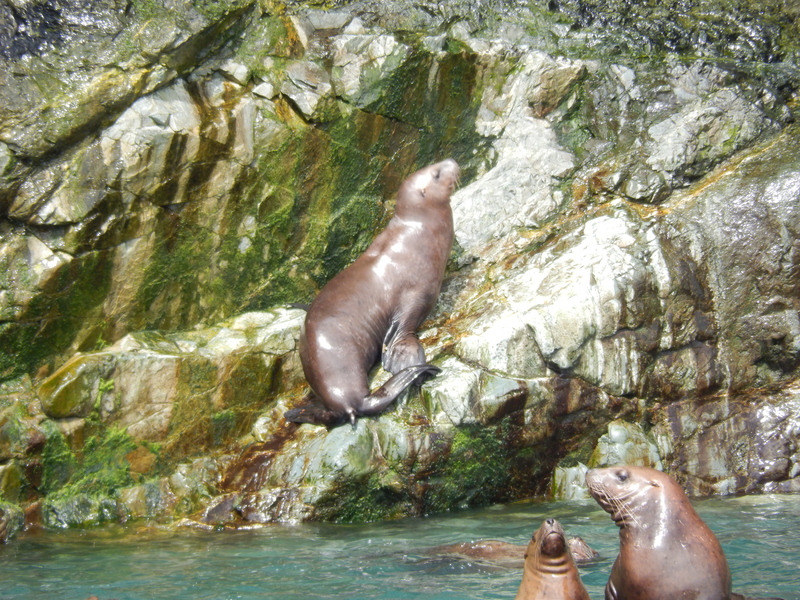 He pulled his boat into cracks in the rock cliffs to let us observe birds and sea lions. 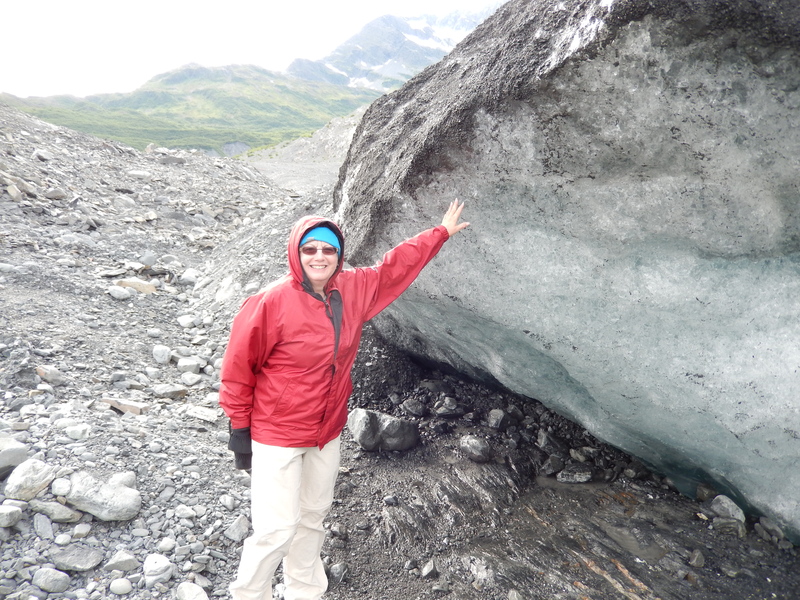 The biggest part of the tour was the Columbia Glacier. The floating ice from the glacier was all over the Sound as we approached the glacier. As we traveled up to the glacier, the temperature started to drop dramatically. The water was so thick with floating ice that the captain had to pick his way through it to get to the glacier. You could hear and feel the ice banging against the hull as we got closer. The Columbia Glacier is huge. We were a quarter of a mile from it and the face of it was so tall that you could not see the mountains behind it. You could hear the glacier calving. Much of it seemed to be happening in the crevasses behind the face, we could hear it, but not see it – very disappointing. 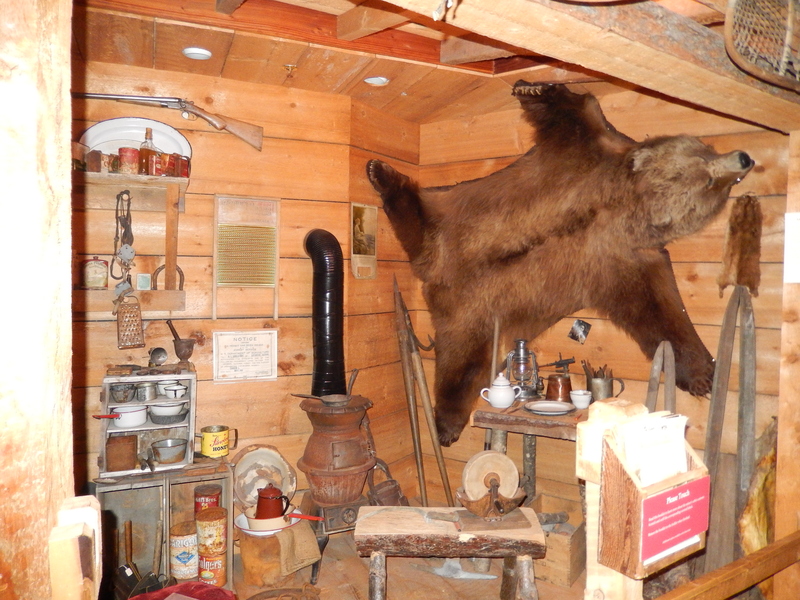 We car pooled to the Valdez Museum where we saw displays about life in Valdez, from the Gold Rush days to the present. You could imagine the disappointment the Gold Rush stampeders must have felt when they took the “All American Route,” sailing from Seattle to Valdez. They thought they would land in a city that would be able to provide them with provisions and support for their journey to the Yukon. 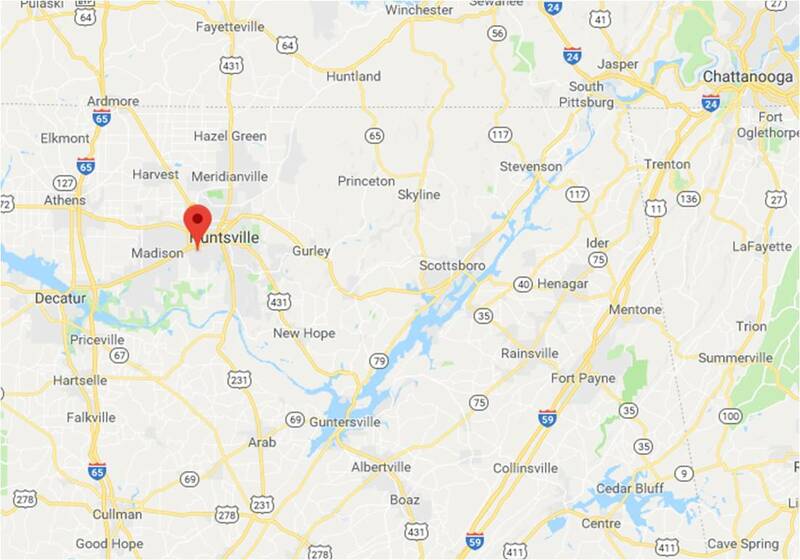 Instead they found a small town of a couple of hundred settlers, struggling to provide for themselves – no docks, ferry and wagon companies; nothing but snow, ice and a long trip ahead of them. It was interesting to see how the town grew over the years. I was particularly interested in the Exxon Valdez spill. I learned some facts that I was unaware of before. You know you are getting old when the things you lived through are displayed in a museum! From there we drove to the Museum Annex that is focused on the 1964 earthquake and tsunami. It destroyed the harbor area and much of the commercial area. After that the City Council determined it was unsafe to rebuild on the same land. Two local residents donated land for a new town site and three years later the new location of Valdez was complete. It is really quite a story. Early in our planning I asked the folks at Adventure Treks if there would be opportunities for kayaking or if we should leave the kayaks behind for this trip. 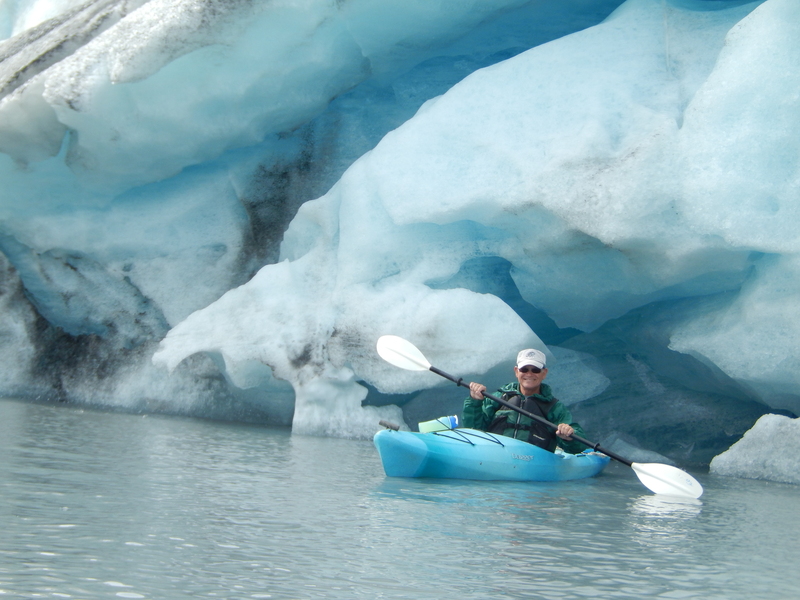 They said there were kayaking tours to the glaciers and sent me a picture of kayakers near the Columbia Glacier. At that point I knew we had to try to do this. After some research we discovered we could hitch a ride with a tour from Pangaea Adventures to the Shoup Glacier. We traveled to the bay below the glacier in a water taxi. The paddle across the lower bay was a bit challenging with the rising tide and a fresh wind coming off Prince William Sound. We paddled up a short channel into the upper bay and we on calm water with almost calm winds. There is a Kittiwake rookery on a small island in the upper bay. It was interesting to see how they would make their nests on small rock outcroppings. They were certainly a noisy bunch of birds! 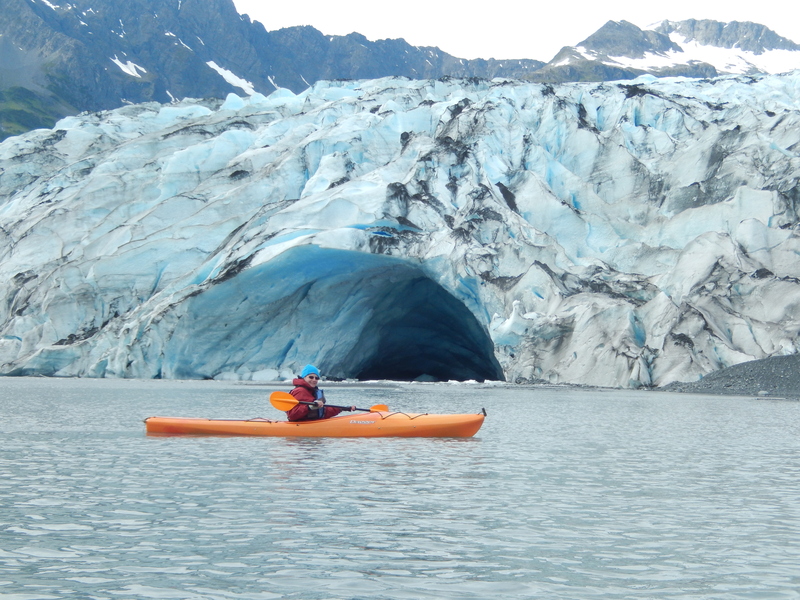 As we approached the glacier, we started paddling through chunks of ice floating in the bay and the air got cooler from the katabatic wind coming off the surface of the glacier. 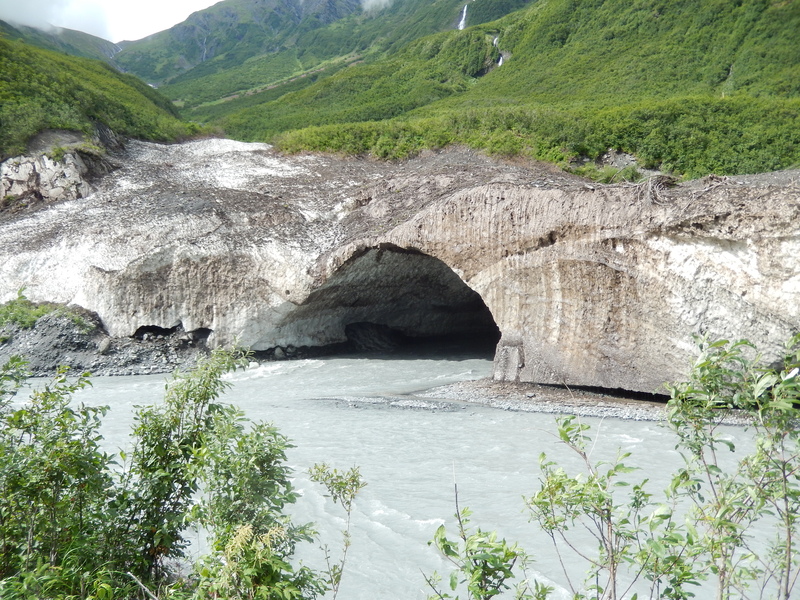 There was a huge cave in the face of the glacier formed by melting water flowing on the surface under the glacier. It was flowing so fast that I wasn’t able to paddle against it for more than a couple of minutes. We took a break for lunch with the tour group and chatted with them before we hiked up the side of the glacier. It didn’t look much like ice because it was thoroughly covered in wind-blown dirt, and looked more like a hill than a mountain of ice. Back in the water we paddled around the face of the glacier, getting close enough so we could reach out from our kayaks and touch it. This was everything that I hoped it would be. 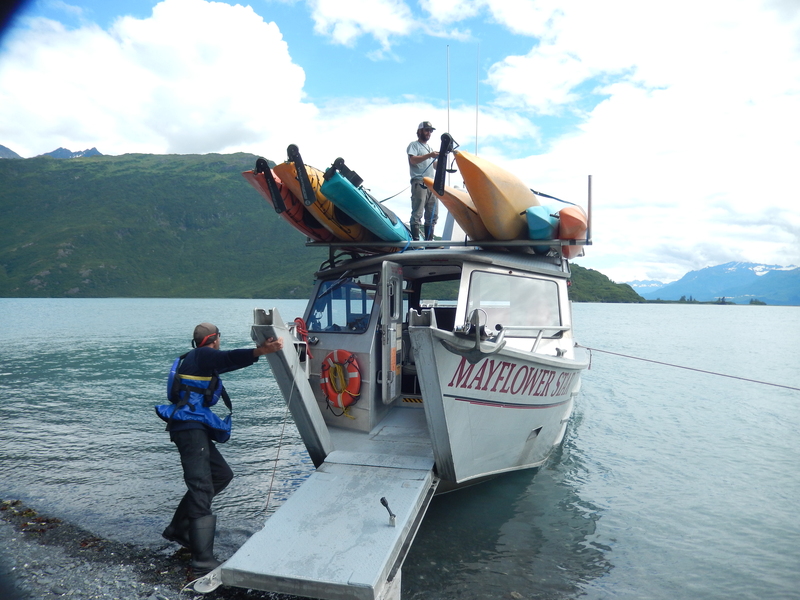 We paddled back with the outgoing tide to the lower bay and we picked up by our water taxi for the trip back. We were on our way to Tok. 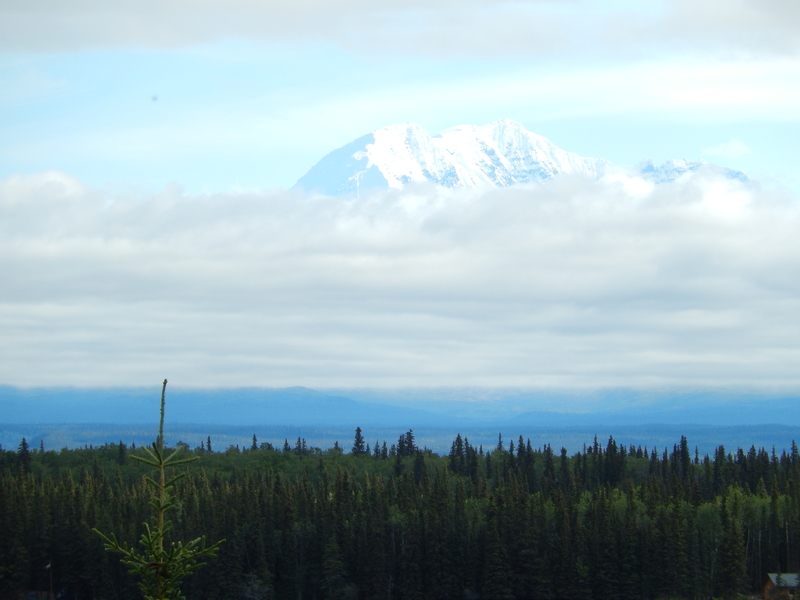 On our way through the Thompson Pass we were able to see Mount Wrangell, with its peak above the clouds. Mount Wrangell is the centerpiece of the Wrangell-St. Elias National Park and Preserve. If we make another trip to Alaska, this is a park where I would want to spend some time. It was an easy drive, although we arrived in a drizzling rain, I think it always rains in Tok. When we got to Tok, we heard that one of our group from Iowa had broke a leaf spring shortly after leaving Valdez. 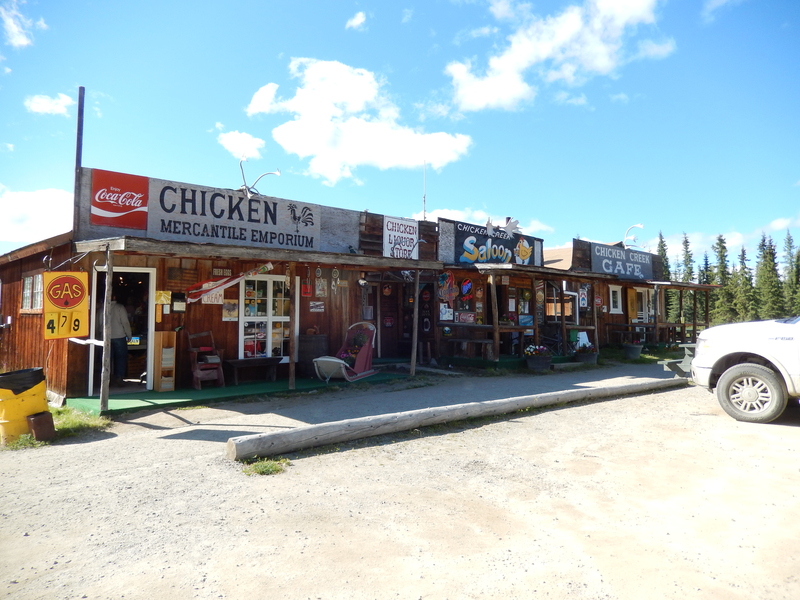 Everett, our tail gunner, had helped them to connect with a repair shop in Glennallen and the thought they would be able to catch up with us in Chicken or Whitehorse. Between Denali and Talkeetna, another one of our group had broken a spring and wrecked his axle. He got it fixed enough that he was able to get to Anchorage where he would get a more permanent repair made. This started getting me worried about having a major problem with our rig. I took a walk to the Visitor Center to watch a video on the building of the Alaska Highway in 1942. I had seen part of the video before, but this was an opportunity to see the entire thing. It was interesting to hear about how unprepared the Army was to build a 1,500 mile road in arctic conditions. I could understand how they hadn’t planned on dealing with the muskeg (a peak moss type layer of decomposing vegetation that was like a sponge) and permafrost (frozen ground that never thaws, until you scrape away the insulating vegetation above it causing it to thaw into a soupy mud). What really surprised me was that many of the soldiers were not trained on the heavy equipment (bulldozers, scrapers, and cranes) that they had to operate and maintain. However, I was very impressed with the flexibility and ingenuity they showed in dealing with these problems, and the logistical effort it took to support six battalions of engineers with food, fuel, and everything else they needed. The Alaska Highway, 1,422 miles of pioneer road, completed in eight months – quite an accomplishment! A short drive today, only 79 miles to Chicken. To say Chicken is a small town is an understatement. It is a small mining town that has a winter population of three people, maybe forty in the summer. It has no government, no police or fire department. “Downtown” Chicken consists of three storefronts; a mercantile, a saloon/liquor store , and a cafe – that’s it! Chicken was named by a bunch of miners who wanted to name it after a bird they saw a lot, but they didn’t know how to spell Ptarmigan, so they decided to just call it Chicken. We stayed at the Chicken Gold Camp. Here were able to take a tour of the Pedro Creek gold dredge and pan for gold. At first I thought, “we did all of this in Fairbanks, why did we come here?” The tour of the dredge (which was almost a double to the Dredge #8 in Fairbanks) was more instructive than Dredge 8. In Fairbanks, they gave us a bag of gravel and we panned that for the gold dust, but if you wanted more, the price was $10. Here we shoveled our own gravel out of a pile and panned it. We could do this all day if we wanted. 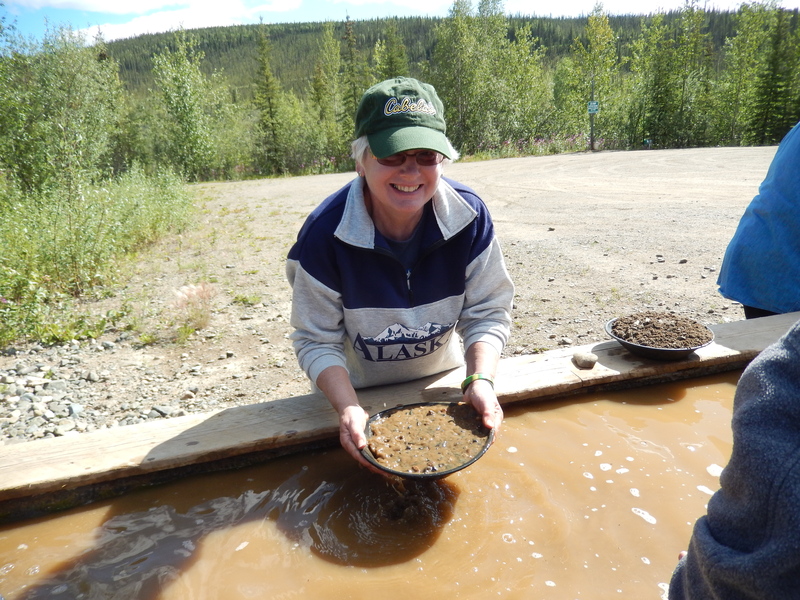 This is known as “recreational gold mining.” Some people will stay here for weeks, panning for gold. It’s like paying for an admission to a theme park or green fees for playing golf. I think we panned for a couple of hours over the course of the day. I thought it was a lot of fun as I enjoyed the challenge of trying to find gold in this pile of gravel, just like the Gold Rush miners. We all got an early start. 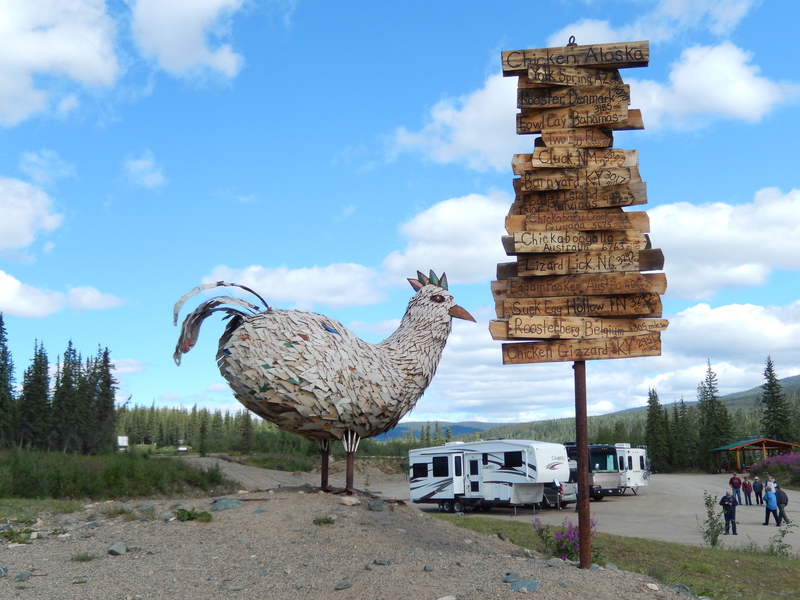 Some of our caravan decided they wanted to drive to Dawson City in the Yukon via the “Over the Top Road,” and the rest of us headed straight for Whitehorse. Either way it was going to be a long drive over some of the worst roads on the trip. I was definitely taking it easy over this rough road. I was now paranoid about driving too fast over a pothole and breaking a spring or axle! However, we had no problems, had some great scenery. We arrived at the White River Campground, which was supposed to have a military vehicle collection. It was more like a military vehicle junkyard. Just a bunch of wreaks from the construction of the Alaska Highway that were abandoned when the highway was complete and dragged into this park – a bit disappointing. After dinner I was sitting by the campfire when a traveler from Germany stopped by to talk. It was interesting; between my poor German and his poor English we had an enjoyable conversation! After Chicken we were essentially headed back to the “Lower 48.” Today we traveled to Whitehorse. A pretty long drive as it is 250 miles to the RV park, and plenty of construction zones to go through. People up here joke about the weather like we do in Michigan, such as “we have four seasons too, fall, winter, spring, and construction.” It wasn’t too bad. We didn’t plan to be the first ones on the road, but we beat everyone else out of the campground and were the first into Pioneer RV Park in Whitehorse. This was the place where we were packed in like sardines, and we wanted to get there while there was room to maneuver. Later that day, the brothers from Iowa rolled in, having their repairs completed. The rigs that went through Dawson showed up the next day. 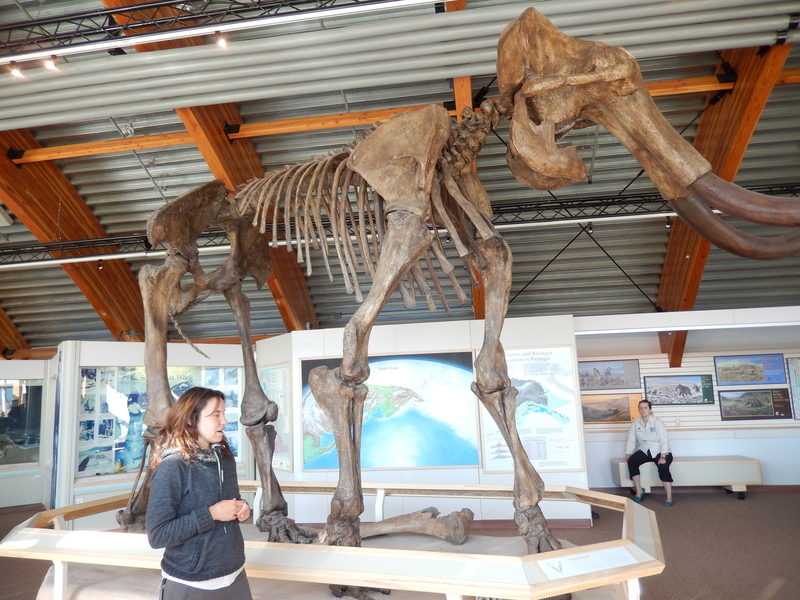 In the morning we visited the Beringia Interpretive Centre. This center describes the land bridge that existed between Russia and Alaska during the Ice Age. We have heard people talk about the migration over the ice bridge between Russia and Alaska, but that bridge is a myth. The glaciers and ice fields consumed so much of the precipitation in ice and snow that the ocean levels dropped creating a huge land mass between Russia and Alaska. 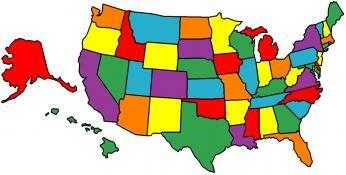 Large mammals such as the woolly mammoth and scimitar cats, as well as native tribes migrated across this land mass. Some continued through a break in the ice fields in western Canada into the Continental United States. 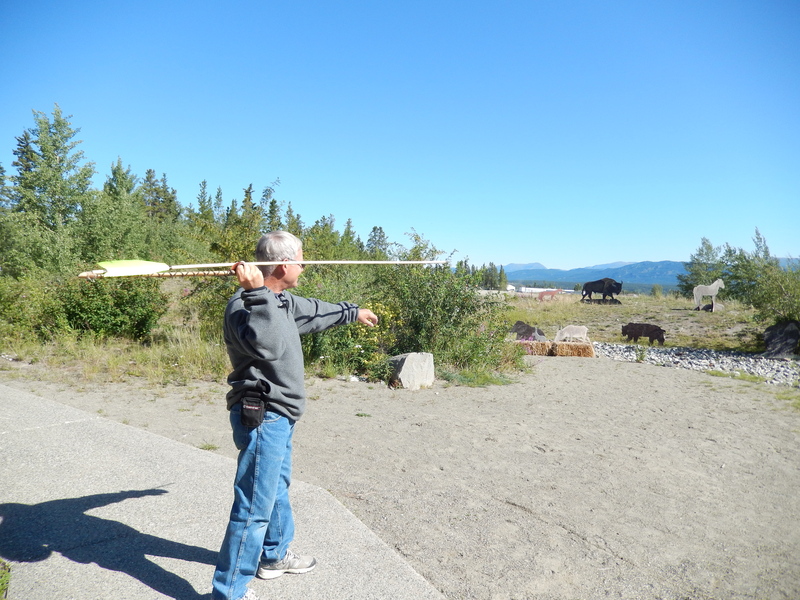 The description was very fascinating and we were able to use some of the tools, like the atlatl used to throw spears. After the Beringia Centre, I went on my own to the Transportation Museum. Here there were many displays of transportation in frontier Yukon. 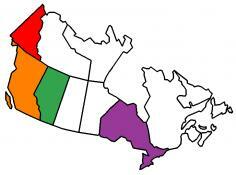 Of course, it covered the Gold Rush and the Alaska Highway. What appealed to me were the displays about the bush pilots, the aircraft they flew, and the risks they took. After this I wandered through Whitehorse doing some geocaching – my first geocaching in Canada. 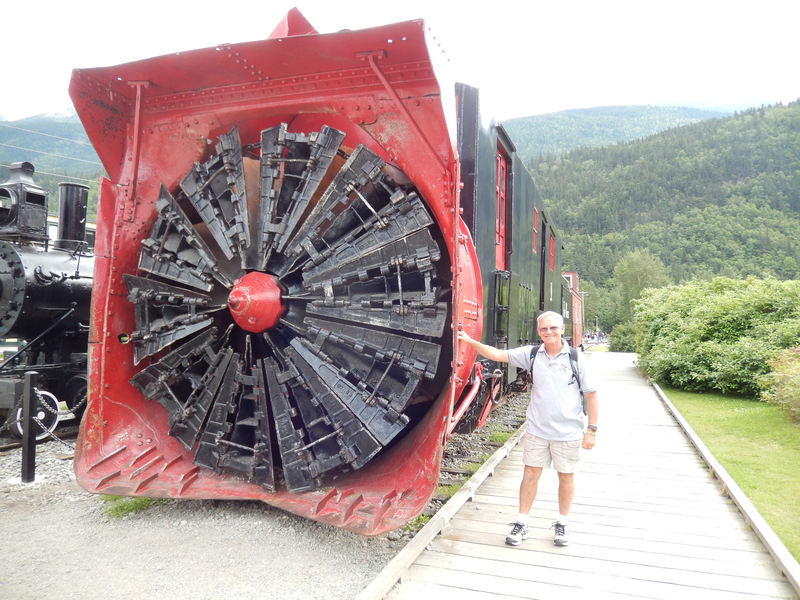 Skagway, AK, was the beginning of the trail to the gold fields for miners coming by sea from the lower 48. 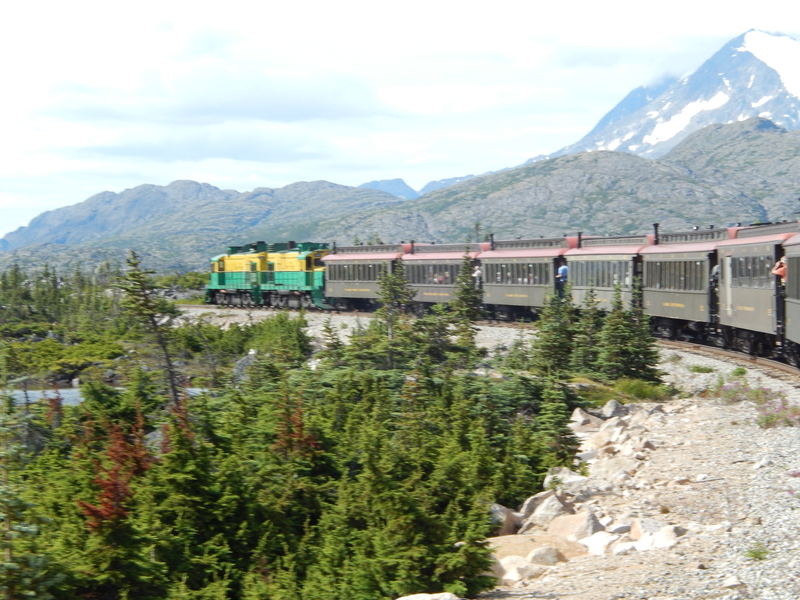 With a combination of tour bus and narrow gauge train, we traveled over the White Pass. 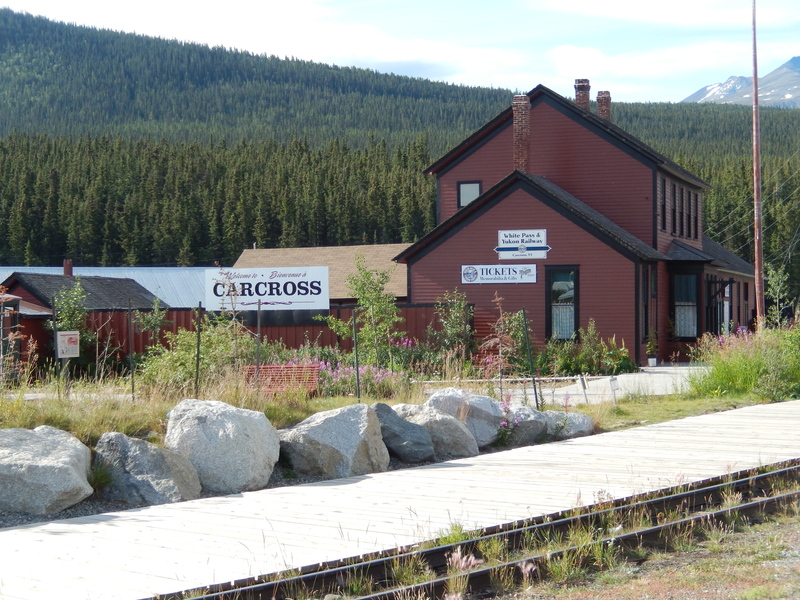 Along the route we stopped at Carcross for coffee and cinnamon buns on the way down and ice cream on the way back up. The White Pass & Yukon Railway was the best way to get into the interior until the Yukon Highway was completed in 1979. As we traveled to Skagway we were given a narration about some of the sights we would pass. We were able to stand on the railcar platforms and get some excellent pictures. 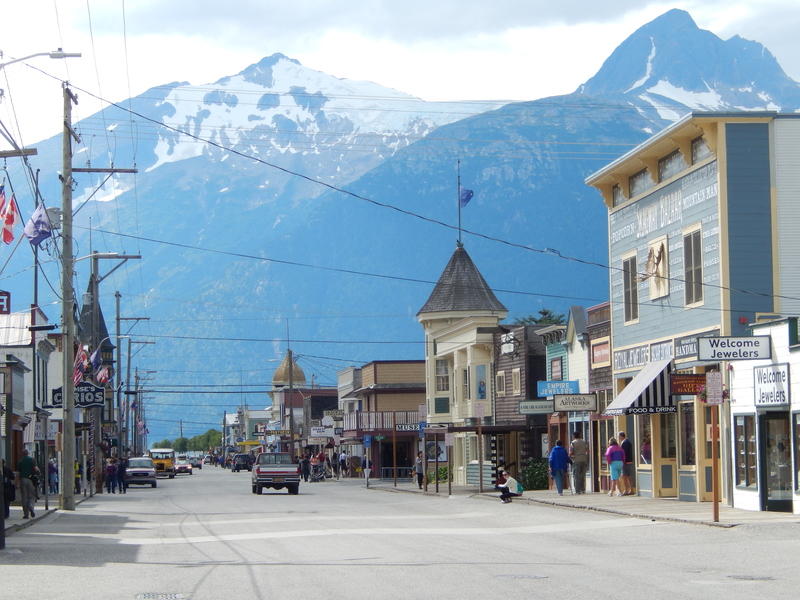 Skagway was a lawless, gold rush town for years. “Soapy” Smith and his gang pretty much ran the place until local citizens finally had enough. “Soapy” Smith was killed in a shoot out and peace slowly became the norm as more and more families followed the gold rush “stampeders,” and settled in town. Physically the town has not changed too much over the years, although tourism is now the leading industry. After we returned to Whitehorse someone suggested we should get pizza for dinner. Before you knew it, almost everyone said that was a great idea, and 27 of us showed up in this small pizza place. The owner said he hadn’t had that much business in one night in a month! This morning really started the trip back home. From this point forward we have mostly travel days and only a few organized events. 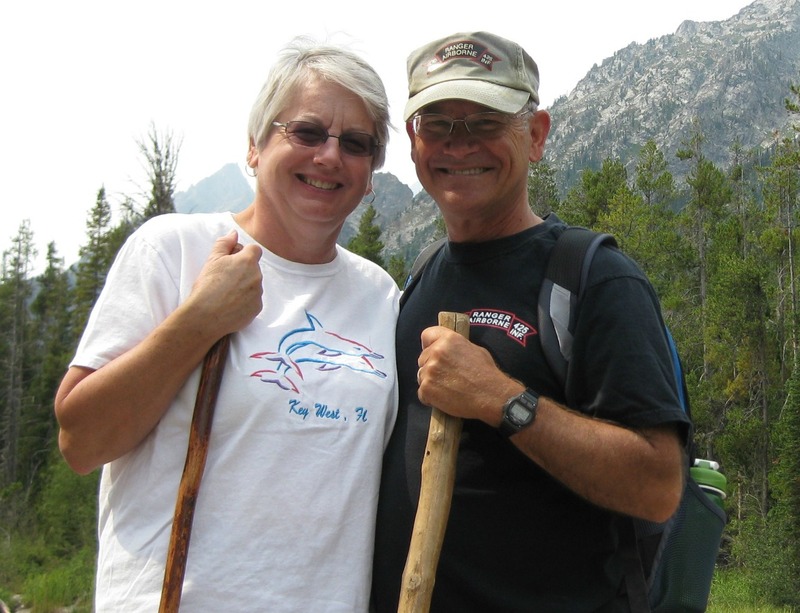 This entry was posted in Adventure Treks, Alaska, Canada, Fulltime RV, Michigan Traveler, U.S. Army Corps of Engineers and tagged Alaska Highway, ALCAN Highway, Columbia Glacier, fifth wheel trailer, full-time RV, fulltime RV, Kayaking, Over the top road, Panning for gold, Prince William Sound, RV Forums, Shoup Glacier, Skagway, Valdez, White Pass & Yukon Railroad. Bookmark the permalink.